One of the tests for the universality of a play is whether an adaptation, done in a style substantially different from the natural or original setting of the piece, enhances its message and its transformational effectiveness. 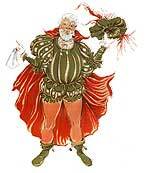 On those few and far between noteworthy occasions, when works by "Shakespeare," Molière, Ibsen, Chekhov, and other greats are elucidated by a well-thought-out conceit, the results allow us to experience the unlimited breadth of theatrical possibilities. Rarer still are those truly unique instances when a playwright builds such stylistic contrast into his or her original book and succeeds at this strategy right out of the box. So it was with heartfelt delight that we watched as Curious Theatre's regional premiere of Paula Vogel's The Long Christmas Ride Home unfolded in such a manner, wrapping an American tale in the most refined techniques of Japanese theatre. Ostensibly, Vogel's story is one told every day in countless families around the globe, where long-standing resentments between married couples bubble up to the surface at the most inopportune times—in particular, family holiday get-togethers, which are supposed to be celebrating the better parts of ourselves. If this were the limit of Vogel's intent, it could be said that she did this very well, recounting her version of the tyrannical hold of instinct and ego on the human spirit in an insightful and thoroughly unique fashion. But here the playwright reminds us not only that she has already exhibited the talent to win a Pulitzer Prize for drama (How I Learned to Drive), but that she is still growing, and capable of reaching or exceeding such heights again. From the moment the strains of traditional Japanese instrumentation and live percussion herald kimono-clad Stephen Pearce's appearance amidst the vertical oriental landscapes and rice-paper walls before us—followed by Josh Robinson and Mare Trevathan Philpott, as Man and Woman, and finally by three Bunraku-inspired puppets as their three children—we enter into a netherworld of familiar dysfunctional behavior echoed in subtle percussive commentary, and framed in Zen-like observations. Robinson and Philpott set up the story by describing the thoughts and performing the dialogue for their own personae as well as those of their children, providing unique characterizations as needed, and conveying a sense of parental influence on the development of their children's personalities. 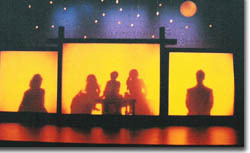 Their narration is crisp, yet projecting a luminosity that amplifies the spiritual nature of the overall presentation. 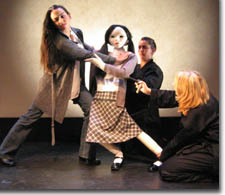 At this point, the task of manipulating the life-like puppets is shared by five actors, three closely associated with the children, and two puppeteers. 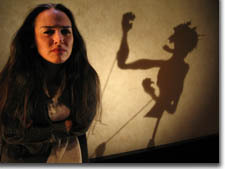 Had the format continued in this manner, again, it would have been sufficient to merit accolades; but as the story evolves and we enter the pivotal car scene from which the title of the play is derived, each of the puppets comes alive through an actor—Karen Slack as the oldest, Rebecca; Stephen Pearce as the middle child, Stephen; and Theresa Reid as the youngest, Claire—each to tell their a tale of a failed relationship with a thread leading back to the opening narrative that ended in a scene all wish would never have happened. Rebecca carries over her resentment toward her sister, her parents, and life in general, from this incident into her present predicament, pregnant by a man she doesn't love; Slack's monologue is dramatically shaded in several colors that wash over our own emotions with impunity. Though too young to understand specifics, Claire absorbs the shame of the incident and brings this to her present situation—her lesbian lover having left her for another; Reid brings home this agony with an alternately plaintive, desperate, and angry performance, tearing our hearts out. Feeling confused, but unable to understand his gay nature, Stephen fails to meet his father's expectations as a child, leaving him feeling unloved; years later it is no different, as he details how his lover lacks appreciation for everything he's done. In a measured performance that holds dramatic tension throughout, Stephen Pierce is the embodiment of the oriental eloquence underlying the production. Enough can't be said about director Chip Walton's realization of Vogel's vision—which was noted by the playwright herself, as she expressed her gratitude for what she considered the finest production of this work to date—and his artistic achievement in seamlessly integrating of all the elements: Michael R. Duran's stunning scenic design; Cory Gilstrap's soulful Bunraku-inspired puppets; Jesus Marquez' astonishing live percussion and evocative shadow puppets; Jeremy Cole's tasteful costumes; Richard Devin's sensitive lighting; and Scott Anderson's distilled sound design. In every season, there are only a few must-see productions; this is one of them. Curious Theatre Company's regional premiere of Paula Vogel's The Long Christmas Ride Home runs through December 18th. 303-623-0524.